The start date and end date of the project as a whole. A Gantt chart lists all the tasks required to carry out the project, and the date at which these tasks must be performed (the schedule). It serves to model the tasks necessary for the implementation of a project and to monitor them. What makes the interest of this diagram is that it is possible to represent the dependencies between tasks, the degree of fulfillment of each task at any time, resources involved and so on. 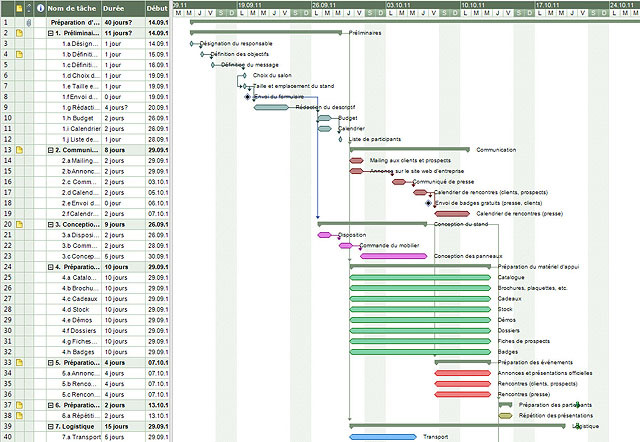 There are many software programs available to make a Gantt chart.